Ultimately, in making decisions and adopting attitudes about pesticides, one should consider both the potential benefits and the potential risks of their use. Pesticides contribute many positives to our society: reduction of insect-vectored and waterborne diseases; production of an abundant food supply that takes only 10 percent of our disposable income; a positive impact on our balance of trade; nourishment for the world; and reduction of soil erosion in conservation tillage programs. Pesticides facilitate the production of grains, meats, and fibers by less than two percent of our population, freeing the rest of us to pursue other vocations. With the world’s human population steadily increasing (to 8 billion by the year 2025), and with limits on the amount of “new” land that can be converted into production, it is likely that pesticides will continue to play an important role in meeting our demands for food and fiber. Though chemical technology has great potential to benefit humankind, we should act carefully. The benefits need to be evaluated continually so that the balance sheet clearly favors the benefit quotients. In order to prevent the use of pesticides that might cause unacceptable adverse effects, testing requirements and review processes are implemented to identify problem chemicals and allow development of precautions and instructions for proper use. Pesticide registration is a process that is mandated by the Federal Insecticide, Fungicide and Rodenticide Act (FIFRA). The details of implementation are described in the Code of Federal Regulations Section 40. Both FIFRA and the regulations outline the basic framework for registration, rules of conduct, implementation mechanisms, and decision-making guidelines. Congress delegates the U.S. Environmental Protection Agency (EPA) to assume regulatory responsibilities and decision-making authority to administer the federal pesticide registration process. The registration process is complex and takes considerable time, resources, and expertise on the part of EPA, the pesticide manufacturing industry, and various public interest groups. This process is ever-evolving to answer new questions and meet challenges posed by the use of pesticides. An expanding series of tests is required in response to public concern and improved technology that provides more precise pesticide residue detections and toxicological assessments. In addition, improved methods for hazard predictions, novel approaches to hazard reduction measures, and incorporation of the broadening scope of relevant scientific knowledge into industry and government policy decisions contribute to changes and improvements in the pesticide registration process. The basic pathway for pesticide registration is: (1) research conducted by the manufacturer prior to its decision to pursue registration; (2) data submission report by the manufacturer to EPA; (3) EPA review; and (4) a decision by EPA either to register the pesticide based on the merits of the data submitted, or to deny registration. The congressional mandate that guides EPA decisions to register a pesticide hinges on a benefit-to-risk analysis of the data. Evaluation of available registration data must provide EPA with an assurance that the pesticide will perform its intended function without unreasonable adverse effects on people, wildlife, and the environment. 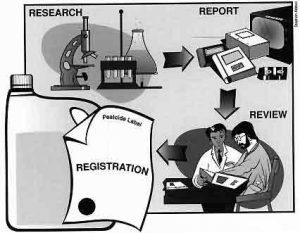 The EPA registration process for a single chemical requires the manufacturer (registrant) to conduct, analyze, and pay for 142 different scientific tests. These tests define product chemistry, risks to humans and domestic animals, the environmental fate of the pesticide, and the pesticide’s impact on nontarget wildlife. Generation of such data for a single compound may take 6-10 years and cost millions of dollars. This table illustrates the scientific information required by EPA when considering the registration of a pesticide. It is impossible, inadvisable, and illegal to test every species abundant, threatened, or endangered with each pesticide. In the regulatory testing process, the test species selected are intended to broadly represent nontarget organisms. Chosen wildlife species typically satisfy the following criteria: ecologically significant; abundant and broadly distributed geographically; susceptible to chemical exposure; commercially available for testing; and easy to handle in the laboratory. For life cycle tests, the species must have a relatively short life span. When possible, species that are aesthetically, recreationally, or commercially important are studied. These indicator species provide the research scientist and the regulatory decision-maker with an information base for assessing potential risks to a broad range of nontarget birds, mammals, fish, aquatic invertebrates, predatory insects, insect pollinators, and plants. 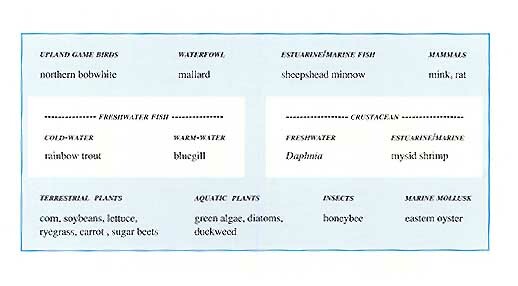 This table lists typical indicator species. Toxicological or phytotoxicological testing normally is not performed on endangered or threatened species. Only EPA-recommended wildlife and aquatic organisms should be used for laboratory testing purposes. The test organisms should be uniform in weight, size, and age. Control groups-those not exposed to pesticides-should be maintained in a manner similar to that of the test groups. The substance to be tested-the technical grade of the active ingredient, or the end-use product-is clearly specified. If the test substance is diluted or dissolved for administration, the carrier should not interfere with adsorption, distribution, or metabolism of the test material; alter the chemical properties of the substance; enhance or reduce the toxic characteristics of the test substance; affect food and water consumption; or impact the physiological processes of the test organism. Detailed descriptions of the nature, incidence, time of occurrence, severity, and duration of all observed toxic effects should be recorded. All data generated must be in accordance with established Good Laboratory Practices for handling and care of test organisms. Final reports should include all information necessary to provide a complete and accurate description of test procedures and evaluation of the test results. Responsible parties must confirm, by signature, that appropriate quality assurance and quality control methods were followed. Test species are exposed to measured amounts of pesticide to establish acute and chronic responses to varying concentrations. A dose can be delivered to the test organisms by various means, depending on the test: mixed with water in aquarium tanks stocked with fish or invertebrates; given as a single oral dose to mammals and birds; applied topically to honey bees; or incorporated into the diet. Typically, in every short-term test, ten organisms each are exposed at four to five dose levels to determine mortality, or other end point effects. In addition to short-term mortality studies, the effects of long-term (chronic) pesticide exposures on reproduction, survival, and behavior are measured. If laboratory studies indicate that the pesticide has a potential for adverse effects on wildlife, the research may be expanded beyond laboratory settings to include studying and monitoring impacts under actual use conditions. 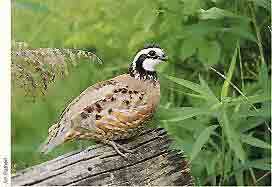 Northern bobwhites (upland game species) and mallards (waterfowl) are used to conduct a series of toxicological tests to quantify the short-term and long-term impacts of pesticides on avian wildlife. These species generally are obtained from pen-reared stock and maintained under temperature, humidity, lighting, and pen size that conform to good husbandry practices and protocols established by EPA. The purpose of this test is to determine the chemical’s acute oral toxicity, expressed as a single dose of material (milligrams per kilogram of body weight) that will result in 50 percent mortality among test birds. The test provides a measure of a species’ sensitivity to a toxic substance. Birds tested must be in good health, from the same source, and preferably from the same hatch. Birds must be at least 16 weeks old at test initiation, and must have been preconditioned to the test facilities for at least 15 days prior to experimentation. The standard study uses ten birds for each of five dose levels. The test material is administered orally to each bird by direct injection into the stomach or crop, or through the use of capsules. Birds are observed for a minimum of 14 days, and any mortality or signs of intoxication are recorded. In addition, an internal examination is made to determine the condition of major organs. The purpose of this test is to determine a chemical’s toxicity to birds, expressed as a concentration of the pesticide in the diet (parts per million) that will produce 50 percent mortality among test birds. Birds selected for experimentation must be in good health and preferably from the same source and hatch. Bobwhites should be from 10 to 14 days old at the beginning of the test. Birds are preconditioned from hatch on a standard commercial game bird diet. Three to five days prior to testing, bobwhites or mallards are randomly segregated into six groups, ten birds per group. Five groups are given unrestricted access to feed containing known concentrations of the pesticide; one group serves as a control and receives standard commercial feed that contains no pesticide. Birds are allowed to feed on the test diets for five days and observed for an additional three days. During the study period, mortality and all signs of intoxication, such as immobility and any abnormal behavior, are recorded daily. The most commonly used test for chronic pesticide effects on terrestrial wildlife is the avian reproduction test. The objectives of the study are to determine pesticidal effects on the health and reproductive performance of egg-laying adults, on embryo viability, and on the survival of hatchlings. One control and three pesticide-treated dietary concentrations (selected to bracket environmental exposures) are fed to four test groups of first year breeders. Exposures begin 10 weeks prior to egg laying and continue during 10 weeks of egg laying. Eggs are collected daily, artificially incubated, and checked periodically for embryonic development; hatchlings are grown on untreated feed for two weeks to check their viability and growth. This test is now conducted for virtually all pesticides. 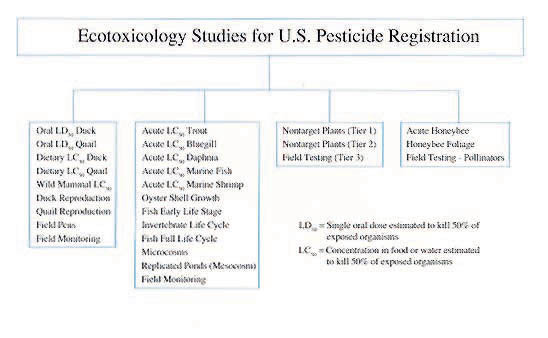 From 1987 to 1992, EPA’s Office of Pesticide Programs increasingly required ecotoxicological field studies both for new chemical registrations and as part of the ongoing reregistration process for older pesticides. Two major documents, Guidance for Conducting Terrestrial Field Studies and Guidance for Conducting Aquatic Mesocosm Studies, were issued to provide detailed recommendations on the implementation of these tests. The former document was concerned primarily with field monitoring of pesticidal impact on birds under actual use conditions; the latter concerned the use of test systems composed of constructed ponds (0.1 to 0.25 acre surface area) treated with pesticides at rates approximating chemical contamination that might result from runoff and spray drift following agricultural applications. After approximately five years of ecotoxicological field testing under these guidance documents, more than 45 avian field studies and 10 aquatic mesocosm studies were conducted. But the results did not add sufficient information to agency risk assessments to justify the time and resources necessary to support the testing, so EPA discontinued it. In the absence of such field testing, EPA is evaluating the risks of pesticides based largely on laboratory test results, estimation of environmental exposures through the use of computer models and literature sources, measured pesticide residues, and pesticide incident data. When such analyses indicate a potential for adverse environmental effects, EPA requires pesticide registrants to implement changes in product use recommendations to lessen that potential. Under this new testing approach, EPA may still require field testing in special circumstances, or may require field monitoring to determine if pesticide use changes have adequately reduced exposures or effects. The first tier of testing consists of short-term, acute toxicity tests that determine lethal dosages, and the general responses of the test animal to the pesticide. These tests include the single-dose oral test for birds, the 8-day dietary subacute test for birds, a 96-hour LC50 test for fish, and a 48-hour test for aquatic invertebrates. A fundamental end point of these tests is to determine the lethal dose (LD) or lethal concentration (LC) required to kill 50 percent of the test organisms. This value is calculated statistically and expressed as an LD50 value (single oral dose) or LC50 value (dietary exposure or concentration in water). The LD50 values are expressed in milligrams of a pesticide per kilogram of animal body weight (mg/kg). The LC50 values are expressed in milligrams of a pesticide per kilogram of feed (mg/kg) or per liter of water (mg/l). The metric units are normally converted to parts per million (ppm) to aid in comparison to environmental residue data. Tests in the second tier evaluate longer-term impacts that might occur. These tests evaluate survival, growth, reproduction, body weight, physiological abnormalities, and other effects that may be chemically induced. An important statistical end point of these studies is the highest concentration producing no observed effect: the No Observed Effect Level (NOEL). Understanding the short-term and long-term toxicological effects from exposure is the first step for measuring hazards, but pesticide toxicity is only a partial indication of relative risks to wildlife. Potential exposures have to be evaluated in order to assess risks accurately. An estimation of the exposure of wildlife to pesticide residue in the environment must be determined. It is called the Estimated Environmental Concentration (EEC). The EEC for birds and mammals is the concentration of the pesticide in or on foods that they might consume. This may be determined in special field studies but is most often estimated from various published sources. 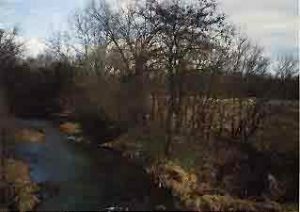 The EEC for aquatic organisms may be a range of concentrations representing typical and worst-case exposures (caused by runoff or spray drift) that may occur in bodies of water adjacent to treated fields. Aquatic EECs usually are calculated, often with the aid of computer models, but also may be derived from field studies. Field monitoring of exposure and ecological effects still may be required on a case-by-case basis to assess the effectiveness of risk reduction measures. Cumulative evaluation of laboratory toxicity studies, chemical fate analyses, and (when appropriate) evaluations under actual use conditions, provides the manufacturer and EPA with data necessary to evaluate and estimate the direct risks to wildlife from the use of a pesticide. Hazard analysis is a comparison between toxicity information and the estimated environmental concentrations. If the EEC is significantly less than levels found to pose acute or chronic problems, the assumption is that the pesticide will not have a significant adverse impact on wildlife. Conversely, if the EEC exceeds levels known to produce problems, the pesticide residues being evaluated may be expected to produce harm. If the data indicate a high likelihood of hazard to wildlife, the EPA may require additional or more refined testing, mandate specific label language, classify the pesticide for restricted use, or recommend against registration.